Residents held an opening ceremony and participated in a number of games on Friday, Aug. 5. Nina Stroyen, Edwin Greenfield and Dorothy Patchell, residents of Spring Hills Cherry Hill Assisted Living, won medals at Spring Hills’ Olympic festivities on Friday, Aug. 5. They were awarded their medals by Nick Richmond, part of the Spring Hills Cherry Hill Assisted Living Recreation team and standing behind the winners. 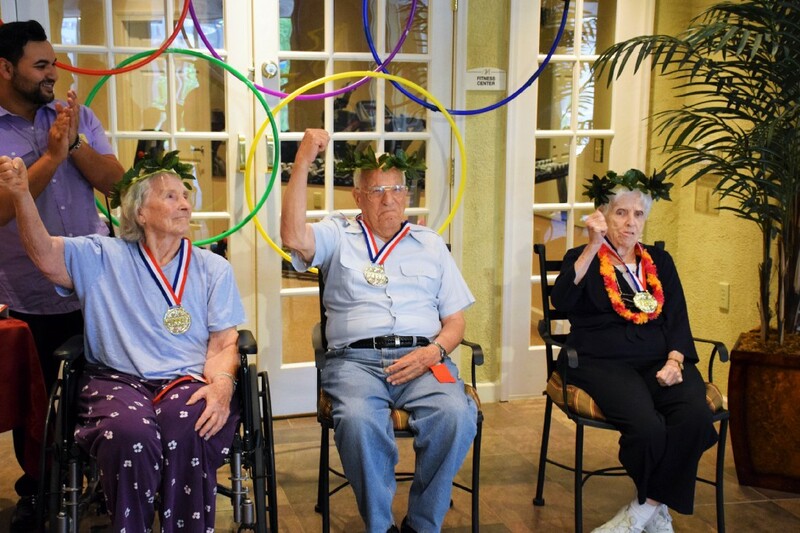 The official 2016 Summer Olympics may be taking place in Rio de Janeiro, but the senior residents at Spring Hills Cherry Hill Assisted Living decided to bring their own version of the Olympics to their hometown. Residents at Spring Hills hosted their own opening ceremony and Olympic games on the morning of Friday, Aug. 5. In the opening ceremony, residents marched paper torches in to the games as Katy Perry’s new Olympic theme song played in the background. The Olympic cauldron was then lit to officially behind the games. The residents participated in a number of games, including volleyball, ring toss and badminton. In addition to the United States, other countries were represented including France, Italy and England.